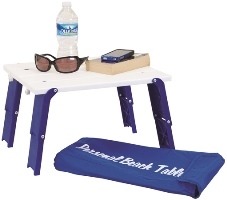 Personal beach table keeps food and gear high, dry and sand-free. Backpack Beach Chairs Now on sale!!! Compact Folding Portable Beach Umbrella. One-click add the PortaBrella beach table accessory to your order below for just $9.95. 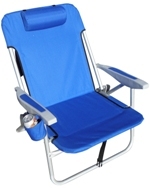 Rio Brands' Hi-Back Backpack Aluminum Beach Chair. Navy Blue. Lowest out-the-door-price on the internet. Guaranteed! Handy umbrella style Beach Cabana.